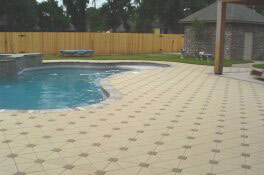 LA Pavers is an established paver installation company. For years, we have been the preferred contractor of residential and commercial clients because of our professionalism and ability to create outstanding paver features and amenities. All our paver installations are known for their unique beauty, durability, and optimum functionality. The outdoor features that we create can last a lifetime because of the premium pavers that we use in our installation projects and quality workmanship. We have already served countless clients in Mandeville, Covington, Slidell, and surrounding areas of Louisiana. Our clients from these areas are more than happy with the beautiful paver features that we have created for them. This is one of the reasons why most of them rehire us to work on other paver installations in their home or commercial property. At LA Pavers we help you realize your dream outdoors by installing beautiful, functional, and long-lasting paver features and amenities. Call us today at 504-731-8755 or visit us at our office at Harahan, LA. Our company is always committed to provide clients with professionally built paver installations. We never settle for mediocre results or perform the task hastily just to get another project. At LA Pavers all of our clients are guaranteed of outstanding outcomes regardless of the scope and difficulty of the paving projects that we handle. Licensed and bonded. Our company is licensed, bonded, and a certified building contractor. By hiring a legitimate company like us, you are assured that we have the capabilities and required competency to work on all types of paver installations. Experienced and certified paver installers. We have many years of experience in designing and building paver features in residential and commercial properties in Louisiana. You can hire us to build patios, pool decks, driveways, and other paver structures. Our crews are all certified paver installers, so they can expertly work on these features. They also know how to install clay bricks, natural stone, and interlocking concrete pavers. Partnerships with leading manufacturers. We ensure the durability of every paver feature that we build by using only premium paver materials. We have partnerships with leading paver manufacturers and suppliers in the country, so we can guarantee the structural integrity and durability of all our paver installations. At LA Pavers we can build stunning paver amenities at rates that you can afford. We are one of the few contractors that can work based on your set budget. We discuss with you all the possible options and the costs that you may incur when you proceed with the paver installation project. Call us now if your project involves the creation of patios, pool decks, driveways, walkways, or garden paths. We will use all our resources to complete these paver installations on schedule.